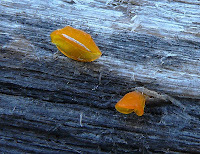 Leotia lubrica: From Fuhrer (2005) - Fruit bodies to 50mm high with viscid stems. 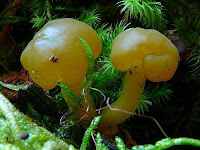 The fertile heads are roughly globose, or sometimes irregular...grows singly or in small colonies amongst leaf litter in wet forest and rainforest. 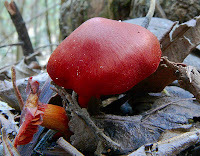 Heterotextus sp. 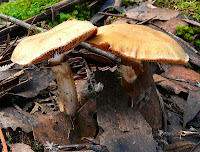 probably H. peziziformis, possibly H. miltinus. Difficult this, thanks for helping. Takes ages to thumb through the books, only to find that there isn't one just like the one you photographed. 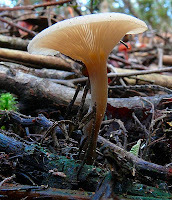 Anyway, I think you're right, another Russula, possibly R. lenkunya again. 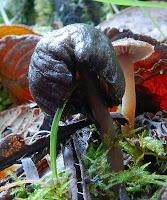 There's also R. clelandii, but I only have this fairly rough photo to go on so far.